Tripoli port is losing customers to cheaper and more efficient ports such as Misrata and Khoms ports (file photo). The Tripoli Chamber of Commerce and Industry (TCCI) has called on all its members and importers to register for a planned meeting to discuss the reasons why importers are no longer using Tripoli Port as their preferred port of choice for their goods. The meeting will be held in the coming days at its central Tripoli headquarters. The TCCI said that it hoped that solutions to any barriers causing importers to use other ports could be identified at the planned meeting. Tripoli Port has been going through a very unstable period since the 2011 revolution. Until very recently, security has been a problem and various militia had jostled over its control. On the other hand, the port’s state-sector employees had been engaging in restrictive practices such as half day working hours. The state union-run truck and lorry drivers also exploit their monopolistic position. Only registered truck drivers can enter the port to transport customers’ goods out. As a result, it bizarrely costs nearly as much to transport a load of goods a few hundred meters to the front gate of Tripoli port as it does to transport it all the way from Misrata or Khoms to Tripoli. Furthermore, Tripoli port is so bureaucratic and slow and takes much longer to process goods. It has become run down and needs much investment in equipment and refurbishment. It needs cranes and quays need maintenance. It’s in nobody’s interest to be efficient at Tripoli port, whereas, the people of Misrata and Khoms are keen to attract as much business as possible to their ports and cities. These factors have led to Tripoli port losing a lot of business to the more efficient ports. 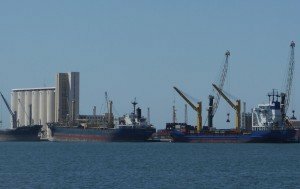 A leading businessman confirmed Libya Herald that ‘‘the problem with Tripoli port is bureaucracy that may lead to corruption, unpredictability of delivery due to poor port operations coupled with high transport costs of landed goods from the port to receivers’ warehouses within Tripoli city’’. He admitted that ‘‘It is cheaper and less costly transport wise and better operations in handling through Khoms or Misurata ports’’.